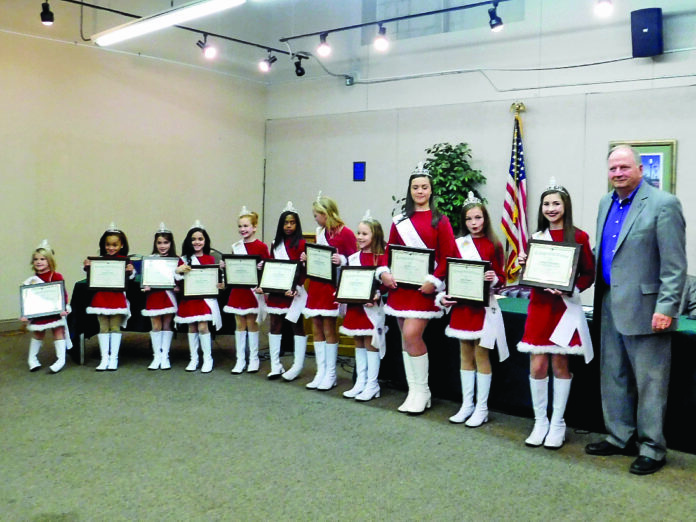 The Christmas Angels were recognized at the City Council meeting Monday. From left are Josilyn LaCour, Kaylee Jones, Lily Liles, Darvy Allison, Presley Trull, Cayla Anthony, Destanee Stewart, Campbell Morrow, Cailynn Kay, Jesse Foshee, Kadence Creamer and Posey. •Drainage project on property owned by BOM on north side of Pavie Street, City to upgrade at a cost of $39,647 and BOM at a cost of $63,097 •Purchase land once owned by the City from Ark-La-Tex Investment and Development corp., for $128,000 The property was intended to be the site of a business incubator but those plans did not materialize. The City will purchase the property for the same amount for which it sold. The Council introduced the following ordinances: •Award bid to MMR Contractor Inc. of Belle Chase for $40,447 for 69 KV line relay panels •Award bid to Merrell Brothers Inc., of Kokomo, Ind., for $316,400 to remove three feet of sludge from Chaplin’s Lake The City has been removing the sludge from the water treatment plant that accumulated in the lake through its own device but the process was moving slowly. Once Merrell Brothers Inc. removes three feet of sludge, the City will again resume sludge removal. It will no longer be visible when Merrell Brothers is finished.